Northern Ireland (Irish: Tuaisceart Éireann, Ulster Scots: Norlin Airlann) is a constituent country of Ireland. The whole island of Ireland used to be a kingdom, called the Kingdom of Ireland. But after the Act of Union in the year 1800, it became part of the United Kingdom of Great Britain and Ireland. This stayed until 1922, after a civil war, when Ireland was divided into the Republic of Ireland, the sovereign state that takes up the southern part of the island, and Northern Ireland, which chose to stay as part of the UK. Sometimes people use other names for Northern Ireland. Some call it Ulster, even though some parts of Ulster are actually in the Republic of Ireland. Others call it "the North" or "the Six Counties", because they do not want to recognise that a part of the island of Ireland is not independent and is actually in the United Kingdom. 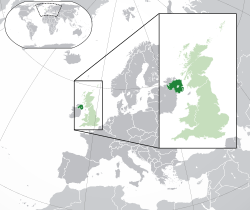 Northern Ireland is the smallest part of the United Kingdom at 5,345 sq mi. English is spoken by almost everyone in Northern Ireland. Another important language is Irish (sometimes called "Irish Gaelic") and a language known as Ulster Scots, which comes from Eastern Ulster and Lowland Scotland. The Irish language became less widely spoken in the 20th century, but a revival has led to increased usage, especially in Belfast, the Glens of Antrim and counties Tyrone and Fermanagh. This revival has been driven largely through the creation of Irish-language schools. The Irish language is spoken by some nationalists (whether Catholic or Protestant) people. Ulster Scots is almost exclusive to areas of North Antrim and the Ards Peninsula. Some languages like Chinese, Urdu or Polish are becoming more common in Northern Ireland as people from other countries move to Northern Ireland. Christianity is the largest religion in Northern Ireland, with over 80% of the population identifying themselves with a Christian denomination at the 2011 census. Almost 42% identify as Protestant, 41% as Roman Catholic, and just over 17% as nothing or another religion. The largest Protestant churches are the Presbyterian Church in Ireland, the Church of Ireland and the Methodist Church in Ireland. Since the Belfast Agreement (sometimes called the Good Friday Agreement) of Friday, 10 April 1998, there has been mainly peace between the two sides of the community. This agreement was agreed by most of the people in Northern Ireland and the Republic of Ireland, as well as the Irish and British governments. It allows for the self-government of Northern Ireland and greater North-South co-operation and co-operation between Britain and the Republic of Ireland. Additionally, it makes clear the right of the people of Northern Ireland to decide their constitutional future and select whether they are British citizens, Irish citizens or both. The most popular sports in Northern Ireland are association football, gaelic football and rugby union. Athletics, boxing, cricket, golf, hockey, hurling, snooker and motor sports are also common. Most sports are organised on an all-Ireland basis, and in international competitions, Northern Ireland and the Republic of Ireland compete together as Ireland (e.g. Ireland national rugby union team, Ireland national cricket team). The main exception is football. Football in Northern Ireland is governed by the Irish Football Association (IFA). In international competitions Northern Ireland has its own team - the Northern Ireland national football team. The Northern Ireland team has qualified for three FIFA World Cups (in 1958, 1982 and 1986). Perhaps the most famous player from Northern Ireland was George Best. Track and field athletes from Northern Ireland can choose to compete either with athletes from Great Britain (as the team "Great Britain & Northern Ireland"), or with athletes from the rest of Ireland (as "Ireland"). Belfast is home to the Ulster Rugby team (which competes in the Pro 12 league and Heineken Cup), and the Belfast Giants ice-hockey team. Trains are run by NI Railways which run from Belfast to Portrush, Londonderry, Bangor, Larne, Portadown and Newry. The Enterprise is run by both NI Railways and Irish Rail and links Belfast to Dublin. ↑ "Northern Ireland Census 2011 Output". NISRA. 2011. Retrieved 2 November 2013. ↑ Norther Ireland Statistics & Research Agency (December 2012). "Census 2011 Key Statistics for Northern Ireland" (PDF). Retrieved 14 January 2013.